Get to know the “rain fish” that come to life during rainstorms in this gorgeous exploration of nature with vibrant collage artwork from the Caldecott Honor–winning illustrator of Chicka Chicka Boom Boom. 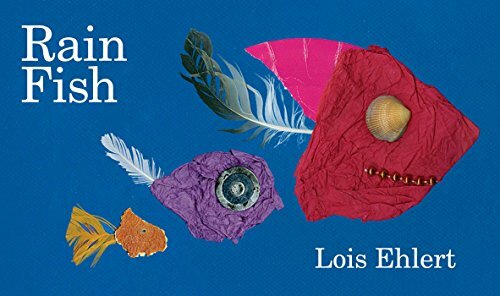 Through lyrical text and her incomparable mixed-media collage illustrations, Lois Ehlert introduces readers to “rain fish”—the varied, colorful, and unique little collections of materials that float along on streams of rain water during storms. From a scrap of newspaper with a seashell eye and feather smile to a piece of cardboard with an orange peel eye and a leaf for a fin, Ehlert’s rain fish come in all shapes and sizes. Complete with an author’s note explaining how Ehlert collected the found materials she used to make the book over the course of a year, Rain Fish is a spirited celebration of imagination, creativity, and observing the world in your own way—and it invites you to discover your own rain fish. If you have any questions about this product by Beach Lane Books, contact us by completing and submitting the form below. If you are looking for a specif part number, please include it with your message.